News is likely to break tomorrow that Wimborne (just one of a number of clubs approached) have formally turned us down again and have announced this news to the Echo. We have been aware of this news for over a week, but chose not to announce it as discussions are at an advanced stage with another party and we hope to be able to break more positive news within a week. I will not be drawn on who or where, so please do not ask, just trust in your BOD. I will never forgive Wimborne! I thought it was a done deal when they went up or was that just the euphoria of the moment? I think they thought they were going to stay up! I am surprised wimborne felt the need to go public, in what was just a cursory request, and they asked us to keep it confidential!!! ?, what did they hope to achieve by now going public? we had moved on and as CD said are at advance stage of meaningful discussions elsewhere. Perhaps they thought we might have won the world cup bid and their stadium might have been used !!!! I don't know anything about the negotiations with Wimborne but can only assume what they are. There is bound to be a bit of local rivalry between us but at this level it should no more than a big brother teasing his little brother. It must make commercial sense for Wimborne to host a groundshare as they get rent plus concessionary profits (i.e. Tea, coffee, beer burgers etc). However if the respective league placings of the two clubs were reversed, then our fixtures would take precedence over Wimborne's and the tail would wag the magpie. Would the BOD please advise the date in the New Year when can at last say the word PXXXXXXXN out loud!!!!!!!! Brian, when we are playing Dorchester or Salisbury and Hamworthy or PB are at home to Bridport Reserves I think it will be strictly no contest in fan appeal!! So let me het this right. 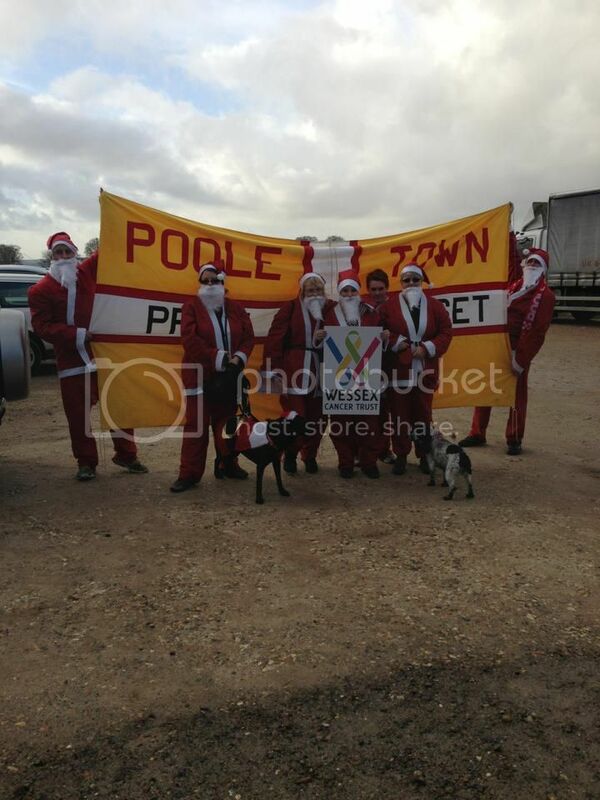 If Poole Town cannot get a groundshare, but win the WPL, they cannot be promoted. In addition, there is only one relegation place from the Southern League Div 1 S&W due to the demise of Bromsgrove. So if PTFC cannot achieve a groundshare agreement, Wimborne could be safeguarded against relegation*? * depends on PTFC winning and the second place team not being eligible for promotion. Wimborne never promised us anything in the first place. They sent a formal response to our request for a groundshare saying that they were planning on running a reserve side and that was why they declined, based on over use of the pitch. We offered Tatnam for their Reserves and I am not aware that they responded. We felt we needed to make the original statement as Wimborne told the Echo that they had declined the groundshare and the Echo asked for our comments. In light that it appeared the story would break, we felt our supporters would rather hear from us first. We have moved on, please have faith that we did not have all our eggs in one basket. Mark I think I am right in saying that we do all trust the BOD. The groundshare is a necessary evil and the only real question is why Wimborne decided to go public. It is in fact reassuring to realise how much is going on unseen and whilst we look forward to hearing the results of the negotiations, either a late Xmas or Early Easter present will be gratefully accepted. CD, i appreciate that this is covering old ground, but here goes. If ( sorry,when) we win the league again, can we not stay at Tatnam if Bearwood has been given the green light ? Would the FA allow us to put up the temporary fences,seeing that we are suppose to be a priority club within the Fa DFA etc, and that it would only be for , say 3 months ? Not just the FA to satisfy. We also need to agree that with the school and they said no last year. I asked personally. Have just read the Echo report on Wimborne fc refusal for a ground share.The reason given was"not an option" as they are running reserves and U18 there would be to many games played at Cuthbury.We offered the use of our home at Tatnum to help with this issue.This was not acceptable,was it the huge traveling distances involved,maybe Tatnam is not ground graded for the leagues these new teams will be playing in.What an absolute crock of S**H.When we were kicked out of the Stadium we played here there and bloody everwhere to survive.You boys had a chance to help out your nearest neighbours and you bailed.Rant over, it would seem that if we retain our title, get planning, get ground share,we still have Tatnum.Hamworthy Rec very strong DPL side denied promotion as they could not install floodlights, in a real fight this year with Weymouth Res.could relocat to Tatnum to progress if that is want they want and earn our club some addional revenue. No ressies or youth at Bash to get in the way of a prem graded ground. I thought that the Dorset FA had already kyboshed any groundshare with Hamworthy? Was this plan B? I think the product is called FieldTurf and apart from the thick carpet employs a continual addition of shredded rubber. I am not sure how many teams in MLS use this, Toronto had an artificial field but replaced due to player complaints. For two teams using the same ground could be a`solution. Expat, don't these new technology astro-turfs cost a fortune? All our funds and more will get us the stadium, could be intersting though. Yes,they may be expensive but looking at today's`echo Hamworthy are going to ask for something to benefit them in any ground sharing deal...what better than an all weather pitch which they get to keep AND showcase right next to the Dorset FA ,capable of handling full fixtures for two teams..and the other side of expensive is, again, unfortunately, how expensive, monetarily and morale wise will it be to miss out on PXXXXXXXN again!! I don't believe you are permitted to use all-weather pitches in the Blue Sq South and above, or in FA knockout competitions. Until that changes, this is a non-starter. Simon respect, held aloft our first PTFC Wessex Title.You guys want Southern League as much as we do.We want to share, will make your County Ground Step 4.Please lets move together,the Hammers,the Dolphins both in the southern league taking it to our friends across the Stour what fantastic local derbies we can all look for ward to. please don't be too concerned re this-we did expect it! Tom is full aware and this is old news really. we are in ongoing discussions with a number of clubs to address this issue. I cannot understand why these so called failed negotiations are ending up in the Echo. Is it a reporter digging about or the clubs briefing? Either way it is far from satisfactory. I know that there is no such thing as bad publicity but it is demoralising for supporters and creates unnecessary animosity between rival fans. That being said, I am behind the BOD and look forward to a late Christmas/early Easter present. baileypete--we are trying for a groundshare since without it we would have to forego promotion for a third time - CM will not be ready in time.Of course if we were to have to stay in the Wessex for at least another season our disappointment I accept would soon be forgotten as and when we move to a new ground but as a Board we are committed to getting up the pyramid as soon as we can and if we don't pull it off we do not want there to be any avenue we did not explore.I have spent a long time today with the FA (wembley) bringing them fully upto date with the current position. John A--we are big news to the Echo-it is vital we keep a rapport with them. They are very supportive but the fact is that they will pursue a story to the bitter end--that is their job.If we don't respond then the story gets printed without our version-there is a huge amount going on that they don't know about and hopefully soon there will be some good news for them to report-if not it won't be for want of trying! !